Your company relies on a unique mix of tools to get work done. Maybe it’s Zoom for calls, Box for file storage, and Outlook for email and calendaring. Or, you could be using Webex and OneDrive, or Dropbox and G Suite. No matter what your mix looks like, Slack takes all of these everyday work tools out of browser tabs and brings them into one central place. And now, that includes Office 365 tools too. 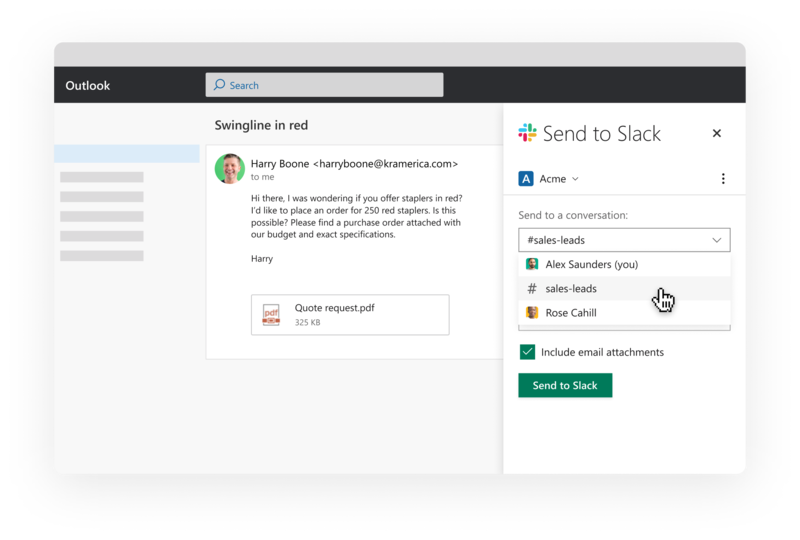 By using apps to connect Outlook and OneDrive with Slack, repetitive tasks such as checking your calendar or sharing email attachments with a group can be done right from your workspace. Each little improvement to these workflows adds up to a whole lot more time for you and your team to do your best work. It’s easy to miss calendar invites when they’re buried in your inbox. To make sure you’re in the right meeting at the right time, the Outlook Calendar app for Slack will message you as soon as you are invited. Not only can you respond with a click, but you’ll also be notified of any scheduling conflicts. We all know the feeling of bouncing from call to call—frantically digging through email to find the latest dial-in link. With the Outlook Calendar app for Slack, you’ll sidestep that stress by getting a meeting reminder that’s sent via direct message and will include a link to Skype for Business, Webex or Zoom. When you’re in a meeting, responding to Slack messages usually isn’t the priority. 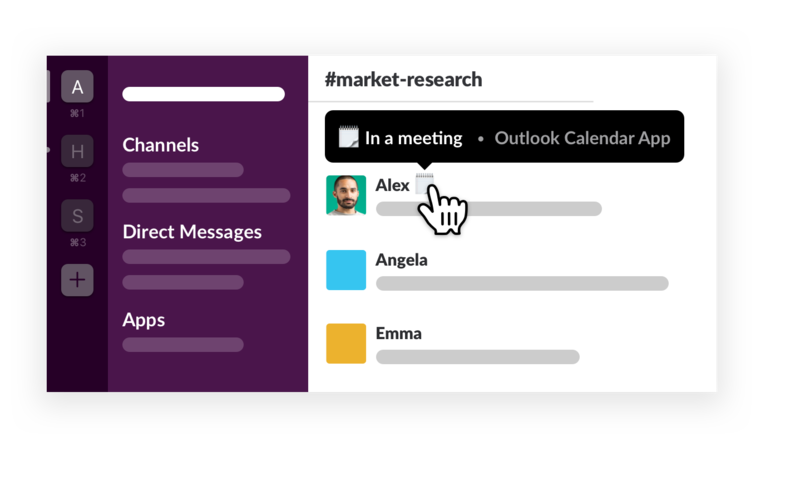 To save you the step of hopping back into Slack and setting a custom status—and to keep your teammates’ response expectations in check—the app will automatically set your Slack status to “In a meeting” based on your Outlook calendar. Working from home to sign for an important package, or away on a much-needed vacation? The app will set your Slack status to “Out of office” when you’ve changed that setting in Outlook. 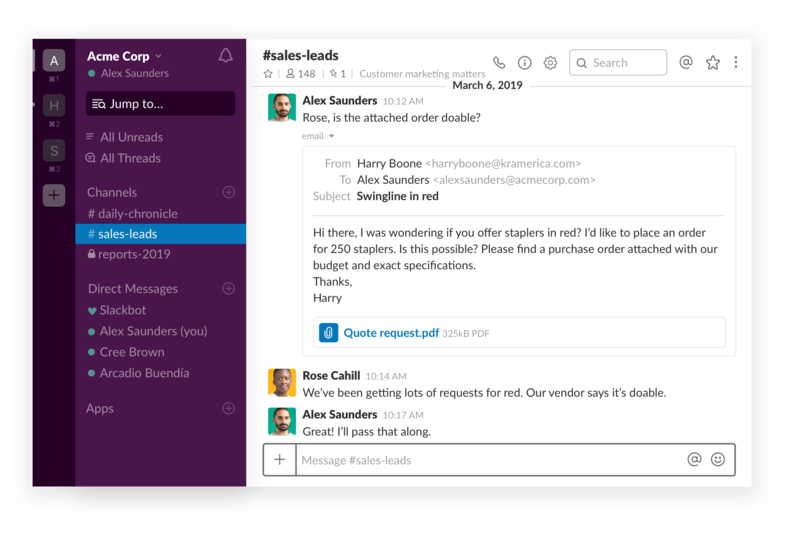 Now you can bring email conversations out of siloed inboxes and into Slack channels where you can collaborate with your teammates. Let’s say a customer emails you with an issue and you need input from engineering and customer support to find the root cause. Or, an agency sends the latest mockups for your next big ad campaign and you want feedback from a wider group. Using the Slack for Outlook add-in, you can forward that email from your Outlook inbox directly into any of your Slack channels or a direct message. Teammates can then coordinate a response in a thread, equipped with the context they need. Use Gmail? Similar functionality is also available. The latest update to the OneDrive app for Slack gives users a fast way to share files and collaborate on improving them. Rather than spinning up a new email chain just to share a OneDrive file, click the + icon that’s next to where you write messages. Then select OneDrive and choose the file you’d like to share. When the file is added to a channel or direct message, members can discuss it in a thread, with the full context, and its content is automatically indexed and searchable. While this isn’t an app, we’ve got one more update that will save you time. You can now scroll through full PowerPoint presentations, Excel worksheets and Word documents in Slack without having to download the document. Review a deck from your phone one last time before a presentation or scan through document revisions while catching up on conversations in channels. We hope to bring similar functionality to OneDrive files too. 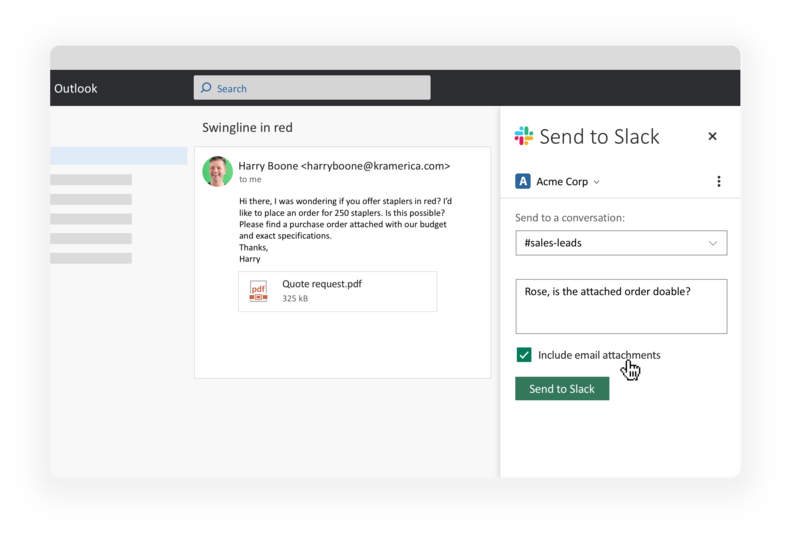 From responding to calendar invites to sharing files, these updates are the first in a series of steps to integrate the work you create in Office 365 with the collaboration taking place in Slack. To keep up with the latest apps for Slack—and discover new ways to bring your everyday tools inside Slack—visit the Slack App Directory.